Download 'pacificCost' A/V loops in Hap 1080p or Hap 480p. f you've missed the original announcement, the Hap video codecs are designed to push the capabilities of high resolution movie playback by shifting the CPU intensive video decoding to the computers graphics card where it can be easily decompressed by OpenGL. The codecs also include an optional alpha channel version for working with clips that take advantage of transparency for real-time layering of videos. ince the release of the open source code on GitHub less than a month ago native support for Hap has been added by a half dozen of Mac applications and frameworks including: VDMX, Millumin, Blendy, Cinder, CoGe, and Jitter, with more on the way. Beyond mixing and compositing more layers of SD and HD video than ever before, the Hap codecs make it possible to work with movies at resolutions not previously possible with other options- in the last post we focused on how Hap compares other codecs for single HD movie playback situations, as a follow up here we'll take a deeper look at how the codecs stand up when using a fast laptop with an SSD to use multiple movies at a time using footage larger than HD resolutions. Hap Alpha movies with transparency from 'pacificCoast' layered over a background movie. 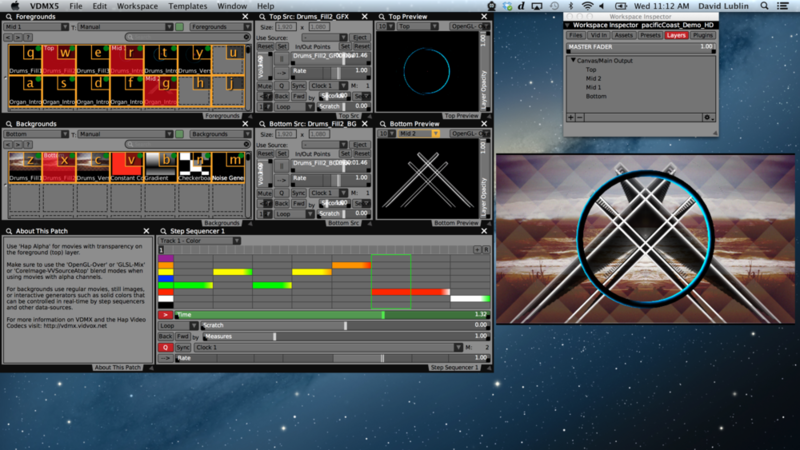 Crossfading between two 3840 x 1080 Hap encoded video clips in VDMX for dual output. If you'd like to try out the performance of Hap on your Mac download the latest version of VDMX and the new sample movies in 1080p or 480p. Also make sure to check out some of the recent tutorials on converting movies into the Hap codecs, exporting Motion projects to Hap Alpha with transparency, and the guest tutorials with the makers of Millumin and CoGe featuring other ways to use their applications alongside VDMX using other open specifications like Syphon and MIDI. evelopers interested in learning more about adding native support for the Hap video codecs in their real-time Mac video software can visit the Hap GitHub repository for sample code and discussion.